We all have our own sleeping positions and each one comes with its own benefits as well as issues. One of the easiest ways to make your preferred sleeping position more comfortable is to use the right kind of pillow. Here we’re going to review some of the best goose down pillows for side sleepers. How Can Sleeping On My Side Be A Problem? Sleeping on your side isn’t necessarily a problem, especially if it is what is most comfortable for you. Side sleeping is a good choice if you snore, suffer from sleep apnea, or have heartburn and acid reflux. This position also promotes good circulation throughout the body. There are a few issues that can occur with side sleeping, though. If you aren’t using the right pillow your neck might go unsupported and might strain the area leading to aches and pains. If your pillow is too thick it might also put your head at a weird angle, leading to more pain problems. If you draw your knees into your chest while you’re on your side, this could cause a few back pain problems as well. Staying in the fetal position like this can also lead to joint strain and overall achiness. Generally speaking, sleeping on your side is a good choice especially if you can’t sleep on your back. Finding the right kind of pillow to address the few issues of side sleeping can make all the difference and allow you to sleep comfortably. Will A Goose Down Pillow Support Sleeping On My Side? A goose down pillow does offer good benefits to a side sleeper and if you choose the right one, you can sleep on your side without worrying about any aches and pains. What Are The Benefits Of A Goose Down Pillow For A Side Sleeper? First, we need to differentiate between down pillows and feather pillows. A pillow that is made of down is made from the soft underbelly feathers of a goose or other waterfowl. These feathers are very fluffy and smaller than regular feather pillows. Feather pillows are made from the top feathers of a goose or other waterfowl and will be firmer and will also have the prickly quills still attached. True down pillows will contain nothing but down feathers. There are some down pillows that will contain a blend of regular feathers and down feathers. So if you want a true down pillow make sure you check that it is 100% down. Down feather pillows have a few great benefits for side sleepers and as a pillow in general. Down feather pillows will keep their loft, or height much longer than a synthetic fiber pillow. Down won’t lose its shape over time and with regular fluffing it will stay nice and fluffy for a long time. A down pillow is going to be one of the softest pillow options that you will be able to find. It can let you sleep in the ultimate comfort without having to move around to find a good spot on your pillow. It is also extremely light weight. Regular feather pillows might be heavy, but because down is so soft and tiny that they weigh much less. Because a down pillow is so soft, it can be molded to fit the curve of your head and neck. This is great for side sleepers because you can fluff up the pillow to offer extra support between your neck and shoulders while you’re on your side. Also, down feather pillows will form to the curve of your head so it is gently cradled while you lay on it. Down pillows will also promote better airflow through the pillow so you can stay cool while you sleep. Are There Any Special Instructions For A Goose Down Pillow? Goose down pillows are great, but they do require some special care to help make them last longer and stay comfortable. Down pillows can last up to 20 years as long as you properly maintain them. In order to maintain the softness of your down pillow, you will need to regularly fluff the pillow. This helps the feathers maintain their loft and keeps the pillow nice and plump. Regular fluffing will also help to get rid of dust that might collect in the feathers and prevent dust mites. It can be a little difficult to wash a down pillow, but it isn’t impossible. Make sure to read the label on the pillow to see if there any special precautions. It is easiest to clean by hand, but in some cases you can use a washing machine. If you have properly covered your pillow, you won’t have to wash it too often. What Are The Disadvantages Of A Goose Down Pillow? While a down pillow does have a lot of benefits, there are a few things to keep in mind before you decide to purchase one. This is the biggest issue with goose down pillows. If you are allergic to any type of waterfowl, then unfortunately you won’t be able to use a down pillow. Down pillows also tend to hold onto things like dust and other irritants so that can also bother seasonal allergies and hay fever. If you have a need for a very firm pillow, then you might want to rethink a goose down pillow. While these kinds of pillows are able to mold to your head and neck and provide soft comfort, they are not super firm. If you have a weak or injured neck and still want a feather pillow, you might want to try a combination of goose down and goose feathers to provide a firmer sleep surface. 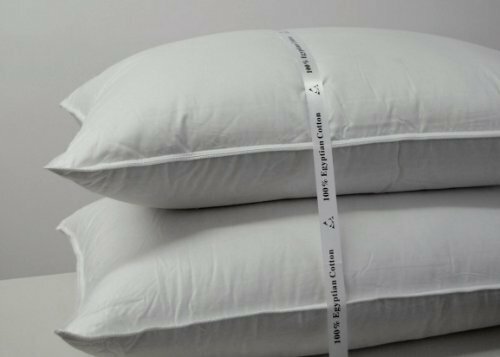 This Better Down goose down pillow is made with 100% down with no blend of regular feathers or synthetic fill. It is queen sized and comes with a 100% cotton cover that is sealed to protect the down feathers. It is filled to a 550 fill power, so it looks like it is overstuffed but will still provide the soft comfort you would expect from a down pillow. Because of the high fill, this down pillow might be able to offer the extra support you would get from a firmer pillow. This pillow is made in the US and is one of the least expensive options when it comes to down pillows. The Marrikas goose down pillow is another pillow that is 100% Hungarian goose down feathers. It has a 1000-thread count cover that is sealed to keep the feathers from coming out. This pillow is larger than most pillows, so a standard pillow case might not work as well on it. The pillow is filled to a 650 fill power, which might make it a little overstuffed for someone who sleeps on their back but a good option for someone who likes to sleep on their side. The Marrikas down pillow is also lightweight at 36 ounces, so it won’t be too heavy to move around. This is another down pillow from Better Down, but it features a higher fill. This pillow is filled to a 700 fill power, which is close to one of the highest fill powers. This is a nice feature because it can give a slightly firmer sleeping surface while still being as comfortable as other down pillows. It has a 300-thread count cotton cover that is also hypoallergenic which is nice to help keep dust mites and other allergens away while you sleep. It comes in a queen size, so most pillowcases will also work with this pillow and it is very lightweight at 33 ounces. These pillows have the luxury of hotel pillows with a good price for at home. The Royal Hotel’s goose down pillows are filled to a 750 fill power and then covered with a 500-count Egyptian cotton cover. The pillows also have a silk piping which gives the pillow a nice finish. This option is nice because you get two pillows instead of just one and they also come in two different sizes, king and standard. The coverings of these pillows are also allergy-free, which is good for helping to cut down on allergens. This pillow from Cuddledown is filled to a 700 fill power with large cluster European goose down. This creates a light and airy sleep surface. The whole pillow is covered in a 450-thread count 100% cotton sateen cover that is hypoallergenic and helps even more with airflow. Two nice features of this pillow are that it comes in four different sizes, standard, queen, king, and European, so you can find a size that works for you. It also comes in four different levels of firmness, which is great so you can find the perfect fit for your sleep position.